Decentralized gains no growth. Companies in this model are afflicted with unchecked proliferation and will have to eventually undergo considerable investments to clean up mis-managed or worse, un-managed efforts. This unscalable model leaves companies fragmented in an uncoordinated method. We predict this structure will eventually dissipate as companies must formalize their programs. Centralized remains stagnant, holds at under one third. This model, in which a single business unit (often corp comms) manages the program on behest the corporation is a short term fix. While many regulated companies can easily make the business case for a single group, it cannot scale –and this group will eventually become overwhelmed with requests from business units. Hub and Spoke loses 6 points, yet still dominant. This popular model, in the previous year, sinks 6 points. Why this drop? 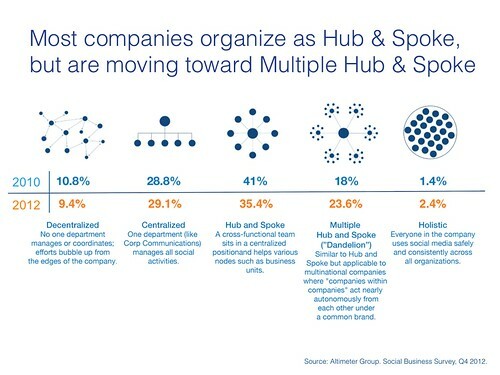 Companies are seeing that social is spreading beyond a coordinated team (often referred to as a center of excellence) to a broad set of business units including regional, departmental, and product lines. Despite the dip, this continues to be the dominant model most corporations are in now. Dandelion model shows growth. In this model, decision making and management for social spreads to various business units –beyond the centralized team. This sign of maturity often means there’s coordination in the center, but freedom for local groups to manage within guidelines. We expect this model to continue to rise year over year. Holistic remains elusive. This very challenging formation, where a majority of all employees use social for business in a safe and consistent manner continues to remain miniscule. Why? This requires a cultural mindset of trust from leaders, and a workforce that is trained and ready to accept social into every fabric of employee and customer relationships. Don’t expect this model to grow anytime soon. While I’ve your attention, I wanted to share that I’ll be hosting a webinar on Social Business Readiness, and share how we’ve helped many companies get ready internally, such as this project on Social Readiness roadmaps, (here’s a screenshot), I’d love to help your corporation get situated in a scalable model for social business. On a related note, Altimeter Group continues to hire, we’re seeking a COO and Senior Consultant as we continue to grow.